I am currently building the Greene and Greene Blanket Chest featured on thewoodwhispererguild.com. I have designed and built everything in my portfolio by myself. Many of the projects were inspired by other pieces and nearly all were helped along with instructional videos and books from various sources, but I really enjoy the puzzle of making a piece that fits a specific need in a specific space, for a specific person. (which for anyone interested, is not a terribly scalable business model). In a future post I'll focus more on that part of the work. Moreover, I typically don't follow a detailed plan. I probably should...I think customers might like to see more detailed drawings with 3D views and all the fancy stuff that even free software now offers. But, typically, I make a pretty good drawing on a sheet of paper that shows the piece from a front, side, and top view. If necessary, I sketch out the joinery or design details on a separate sheet of paper. On the back, I write down the dimensions and joinery notes. As I work, if I need to think through something, rather than turning to a plan, I might just sketch out something on a workpiece or a scrap piece of wood. Then, I start making sawdust. With this project, I'm using someone else's design and following the detailed video guidance on the processes. There are multiple ways to complete most operations in the woodshop but Marc over at thewoodwhisperer.com usually provides several and gives a lot of details...can't recommend it highly enough to any woodworkers out there. Thing is, he likes power tools a fair bit more than I do. I have the tools and use them when I need/want to, but I usually prefer to power my tools with donuts and beer (from the night before). So the project is expanding my comfort zone with jigs, pattern bits, and noise in general. That's not to say my handtools are getting rusty (I did a lot of the milling with my planes). Finally, I'm building in the Greene and Greene style, which is a departure for me. I think the work is beautiful, but it didn't really appeal to me as a style I wanted to explore as a builder until I saw this chest. It involves a lot of detail work (36 ebony plugs, each made individually, on each chest). But that tedious work pays off with some amazing wow factors. One thing I'm not changing, is my effort to build two of each thing I make whenever it is practical. The advantage of this, as I see it, is that in many cases, making multiples is often very little more work once you are set up and doing an operation (especially when machines are involved). I also see it as an opportunity to get more practice. 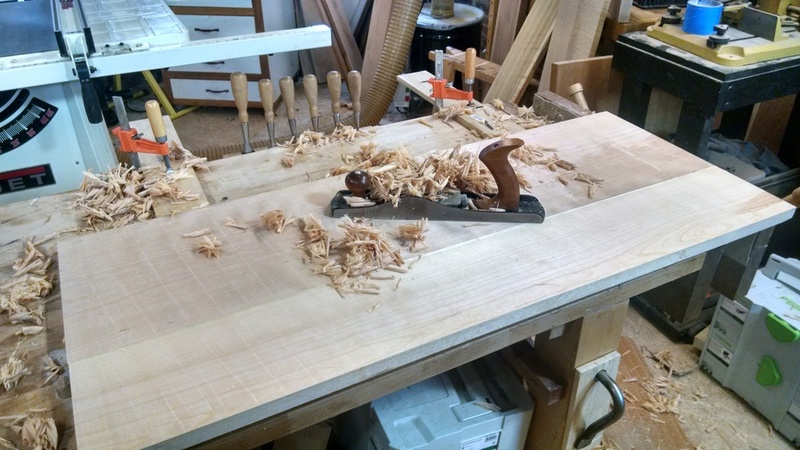 Sure, there is an upfront cost in terms of milling more wood (and buying it), but a lot of the time involved in the craft is getting your workpiece set up and figuring out the operations. Executing them takes less time and we only get better the more times we do them. Moreover, if you make a mistake on a customer's project, you have spare parts. If you're good (and this has thankfully been the case so far with this policy) you get a piece for yourself or to sell to someone else. 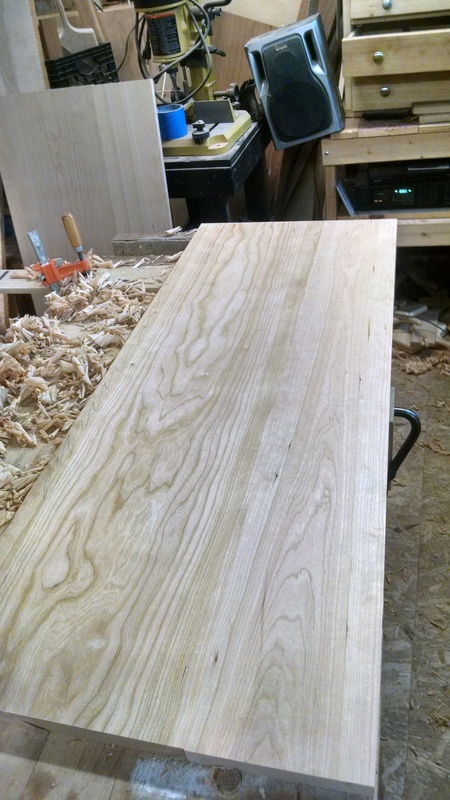 Planing boards flat and smooth is labor, nothing glorious about it. You have to stay hydrated (add lemon to your water to keep it classy) and invest in good tools. 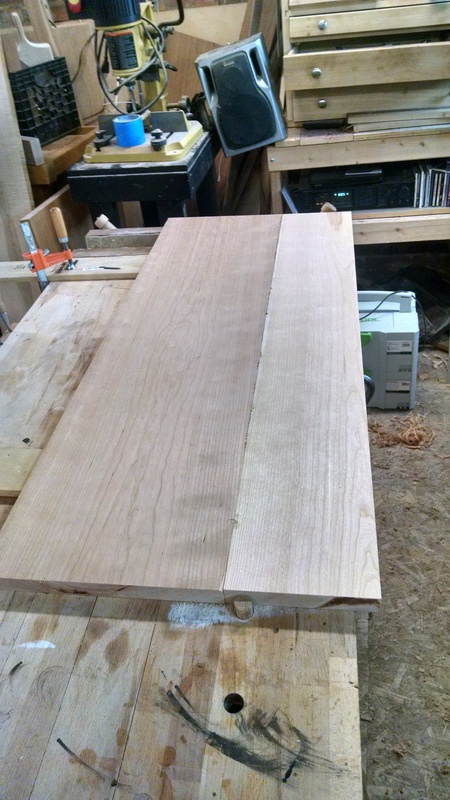 Big 4 foot straight edge making a cameo here too...only way to ensure flatness, etc. When you flatten panels with a hand plane, you get this...piles of shavings. I'm a hand plane geek, but this one is my favorite. The long bed gives you a long surface against which you can register the workpiece and ensure flatness/straightness. It takes practice, but I believe it is probably faster than a power jointer in the long run. 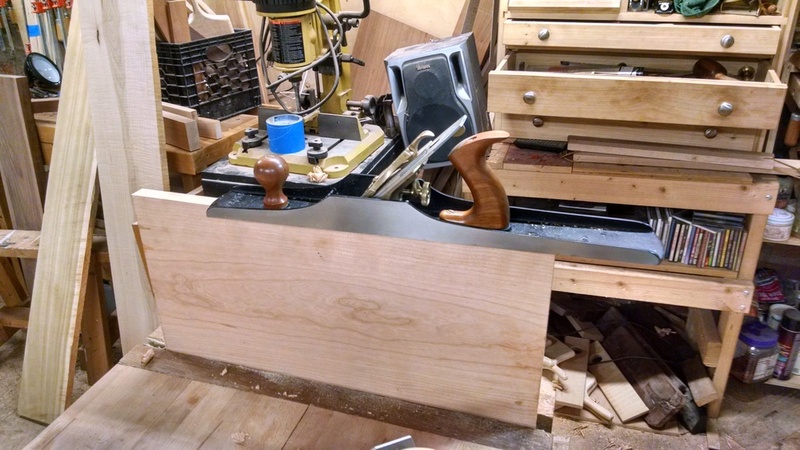 OK, the jointer is my favorite workhorse tool...but this shooting board plane may be my favorite extravagance. You don't have to have one of these, but you don't have to own a porsche either. They're both just exquisite (totally assuming about the Porsche, I drive a bicycle).